The wacky adventures of the Pritchetts and the Dunphys continue unabated in the seventh season of ABC’s hit sitcom Modern Family. Plot: Three different, but related families face trials and tribulations in their own uniquely comedic ways. Run Time: 8 Hr. 19 Min. The wacky adventures of the Pritchetts and the Dunphys continue unabated in the seventh season of ABC’s hit sitcom Modern Family. With the core children of the cast growing up fast with problems less funny and endearing than when they were little, the show’s comic momentum sometimes stalls when the spotlight falls on their storylines, almost always this season dealing with thwarted romances, but the adults are as nutty and eccentric as ever making the show still appointment viewing even if some of the utter hilarity is blunted particularly in the latter third of the season. Some monumental events happen to the central adult figures of the Pritchett and Dunphy households during the seventh season. Jay Pritchett (Ed O’Neill) decides to retire from his closet building empire after forty-two years giving him more time to pursue other interests including finally fulfilling a lifelong dream of becoming a pilot in one of the show’s funnier outings. Daughter Claire Dunphy (Julie Bowen) takes over the firm and works herself crazy trying not to let her dad down, even resorting in one episode to having employee Ben (Joe Mande) serving as her personal assistant doing chores that enable her to appear as the perfect boss and the perfect mom. Child-man Phil’s (Ty Burrell) major investment in comedy this season involves some foundling duck eggs which he nurses toward hatching and later their becoming household pets until they’re too large to be anything but a nuisance. There are also a couple of funny episodes revolving around two very unusual houses he’s serving as realtor for, one which has impossible-to-maneuver geography (basement steps which lead to the second floor) and the other a love shack which every member of the family ends up retreating to in one of those farcical Modern Family set-ups that provide a huge number of laughs. Even funnier is the season’s best episode, a hilarious group therapy session with a psychologist (the hysterical Catherine O’Hara) spouting psychobabble as the three adult couples struggle to either cooperate or avoid revealing too much before the others which they know they’ll never live down. Another winning episode is the Christmas episode where Gloria books a cabin in the mountains not knowing that it’s still being occupied by a bitter old woman Fig (Andrea Martin) who points out their foibles and plays on their weaknesses. As for the growing kids, the two Dunphy daughters have by far the more engaging storylines this season. Hayley (Sarah Hyland) is devastated over losing the love of her dad’s assistant Andy Bailey (Adam DeVine) when he goes back to his former girl friend and becomes engaged. So, Hayley retreats to her old familiar romantic interest, airhead Dylan (Reid Ewing) who now has a t-shirt business he’s trying to get started. The continuing evolution of the Dylan/Hayley/Andy triangle is unquestionably the most involving of the younger stars’ storylines even though the writers this season give almost no attention to Hayley’s community college education (she graduates in a throwaway scene late in the season) or her job as a stylist’s assistant which is mentioned but not shown this year. Alex’s (Ariel Winter) first year at Cal Tech finds her unhappy with the lack of seriousness on campus and her desire to move back home and commute to school though she spends far too much time obsessing over various boy friends who come and go in her life. As usual, the family takes her for granted since her problems are always so minor compared to the shenanigans of her less intelligent brother (Nolan Gould) and sister. Jay and Gloria’s (Sofía Vergara) youngest child Joe (Jeremy Maguire) is old enough now to handle some lines and throw zingers out at the right moment, but his presence lessens what Cam (Eric Stonestreet) and Mitchell’s (Jesse Tyler Ferguson) daughter Lily (Aubrey Anderson-Emmons) is given to do in season seven. Also underutilized this season are Manny (Rico Rodriguez) and the Pritchett’s adorable dog Stella. All of the cast continues to give winning performances in their respective roles though this season only Ty Burrell earned an Emmy nomination, the least number of performance nominations for the cast since the inception of the show. He did have a stellar year showing tremendous dexterity on a hover board and managing to make his triumphs and his tragedies both funny and endearing. It’s also an excellent season for Ed O’Neill whose character undergoes a retirement not to his liking and a softening of feelings toward his in-laws which made him less gruff than in previous seasons. Apart from a brief cameo from Shelley Long as Jay’s ex-wife Dede and Cam and Mitch’s friend Pepper (Nathan Lane) in one episode, however, the show does not bring back many of the recurring actors who have made the show such a welcome place to visit for the last seven years. The transfers retain the widescreen television aspect ratio of 1.78:1 from network broadcasts, and they are anamorphically enhanced for widescreen televisions. After four seasons of Blu-ray releases, season seven is the third season relegated only to DVD. The transfers offer good to very good sharpness (for standard definition) and color that is solid and consistently maintained. Contrast is likewise continuously well applied resulting in better than decent transfers of the 720p quality of the broadcast material. Each episode is divided into 5 chapters. The Dolby Digital 5.1 sound mix mirrors the broadcast quality of the program. It offers a solid encode for the show’s most important element: dialogue. It’s placed firmly in the center channel and has been expertly recorded. Occasionally, there are some fleeting uses of the fronts and rears for ambient sounds: voices of muffled chatter in several restaurant scenes, a vehicle speeding past, and the like. Apart from the main title music, a background score is not really present in the series unless the characters enter a location which has piped in music. Deleted/Alternate Scenes (6:32): fifteen scenes are presented in montage. Growing Up Modern Family (5:14): actors Ariel Winter, Nolan Gould, and Rico Rodriguez describe growing up on the set of the hit show with clips from early seasons showing their transitions through adolescence. Kids in the Spotlight (2:58): Ty Burrell, Rico Rodriguez, and Nolan Gould attend the award ceremony for Kids in the Spotlight, a charitable organization for underprivileged youth interested in the arts. 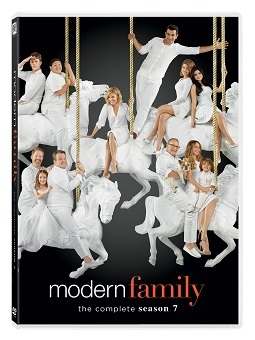 While the seventh season of Modern Family still contains plenty of laughs and also some poignancy in the ever-growing relationships within the Dunphy and Pritchett families, it’s fairly clear that the show has peaked, and while it remains ABC’s top-rated comedy, it would seem not to have too many more seasons left to run. While Fox continues to disappoint by releasing this series only on DVD, a good upconverting player makes this year’s DVD transfers a grudgingly acceptable compromise to no Blu-ray release. Recommended! I stopped buying these after S4 though due to the lack of BD releases. Really wish Fox would reconsider this and reissue 5-7 in BD. Thanks for the review, Matt. But yet again, no Blu-Ray no sale.